RummyCulture proudly presents RC WoW Tournaments™. India’s largest FREE tournaments where everyone gets a guaranteed prize, even if all you do is join! Be a part of these epic tournaments which will be played by over 1 Lakh Rummy players from across the India, who will play and win a total of Rs. 50 lakhs on RummyCulture.com. If you are new to RummyCulture, you can get welcome bonus up to Rs. 2200 to play any tournament on our website or app. Why is RC WoW Tournaments™ Unique? Remember, this is WoW tournament – a Win or Win situation. No matter how long you stay in the game or how soon you quit, you will definitely win! Your focus should be on making sure you are the winner of every table you participate in. The more tables you win, the bigger your cash prize. When you’re playing RC WoW Tournaments™, sky is the limit! Just join one and you’ll find out. Cash prizes worth Rs. 50 Lakhs to be won. Everyone wins something! There will be a total of eight RC WoW tournaments till 30th September 2018. Here is the date, day, and time of each of them. If you haven’t already, create your RummyCulture account. Log in and you will see all the upcoming tournaments with date and time. Choose the one you want to participate in. For best playing experience…. Remember to tell your friends and fellow Rummy Players to be a part of these epic Rummy tournaments. 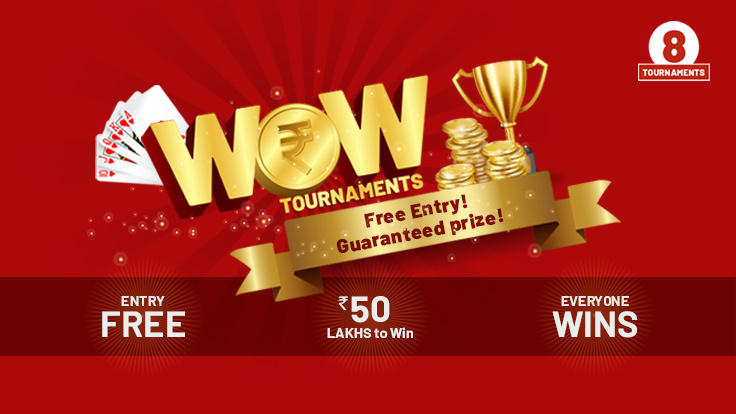 It’s a first-ever WoW (Win or Win) event, with assured cash prize for every player.